After completing their first season in the FSRA British F2 Cup, husband and wife sidecar racing team Jen and Giles Stainton have been awarded the Committee Cup for their achievements throughout the year. The FSRA committee cup is presented for achievement, loyalty and perseverance throughout the year and was a unanimous decision. Jen, from Market Rasen, explained: “It is chosen annually by members of the FSRA committee and was won by Lee Crawford in the two previous campaigns. “The reasons they felt we were the most deserving was for our enthusiasm in coming into the series, with our initial doubts over how competitive we felt we would be, and excelling, gaining podium places in the Cup. 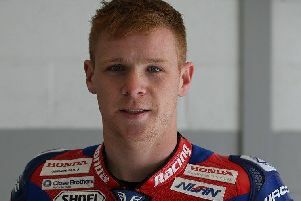 “It was also for always appearing professional on and off track, and especially for coming back from our big crash at Cadwell to complete the remainder of the season. “It is usually a trophy which they have to debate over, but several committee members had nominated us and it was agreed that we were deserved recipients. “It was totally unexpected and an honour to have been chosen for this award from a very competitive field of teams; we were overwhelmed that we were chosen! “Thank-you to all of the committee for this; your support and faith in us has meant everything. The team will shortly take part in some pre-season testing prior to the opening round of the 2018 British F2 Sidecar Championship at Croft on April 7 and 8.